That this song is problematic for performers may come as something of a surprise for those who like their Schubert effulgently romantic. But Gerald Moore confessed to me that of all the Schubert songs this was the one he liked the least. It is true that the borderline between a fine performance and one which tips the scale into sentimentality is a fine one. 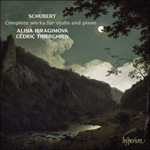 The music can all too easily appear to be cloyingly self-indulgent, a failing which rarely muddies the clear waters of Schubert’s honest and lucid style. The augmented second which we hear in the very first bar of the melody later became a romantic cliché in self-consciously soulful music; as Capell says, ‘such chromaticisms were overworked by the generation that followed Schubert to the point of wearying the world’. Added to this, the tempo ‘Langsam’ (exacerbated by most performers’ tendency to exaggerate this composer’s slow tempo markings) and the seemingly unending repetitiveness of those key words can all too easily sound laborious. We wearily come to the conclusion, as the singer once again climbs the stave for the greeting, and descends it for the kissing, that this lover is a bore—he protests his adoration too much, and after a while we cease to believe him. Many is the time that valiant singers, trapped within a draggingly slow tempo, have attempted to traverse this song’s heavenly length, their fixed smiles of delight and adoration slipping by the second, as they negotiate the not inconsiderable technical difficulties of the music. Capell, in a remarkably eloquent note, makes a case for the song: ‘There is a moment in youth when the fire of profane desire burns so clear as to be spiritual, and the carnal thing is sacred. In this glow the superb song was conceived. There are serenades playful, frivolous, persuasive, cynical. This one is noble.’ The song is undoubtedly noble, but it does not seem to me to be a serenade, nor a waltz of any kind, which is how one often hears it presented in those performances which are not too slow. Admittedly there is a certain similarity to the celebrated Rellstab Ständchen (both songs are in 3/4 and have mezzo staccato quavers in the accompaniment). Perhaps this is why generations of performers have come to see the work as a radiant love song. But even a superficial reading of the poem shows all sorts of imagery not appropriate to the expression of happiness: the feminine verbal noun ‘Entriss’ne’ (the one torn away); the ‘Tränengusse’ (flood of tears); the ‘hostile and divisive’ distance that separates the lovers; the ‘envious powers of fate’, and so on. In most ‘serenade’ performances these words come across as self-indulgent hyperbole. But it is clear that before this song is sung there has been a catastrophe which has given rise to the lyric—this is no commonplace lover standing with his lute beneath a balcony. Conventionally, the singer has to be smilingly aglow with love as he sings, and it is this that is in conflict with the distinct thread of bitterness, loneliness and abandonment which runs through the poem. What is not clear is whether the ‘time and space’ that separates the two can ever be traversed by human beings. Perhaps, with the poem’s oriental background, two doomed young lovers have been separated by the jealous edict (‘the envious powers of fate’) of a cruel Sultan. On the other hand, if we accept the possibility that this poem, from the poet who wrote the Kindertotenlieder, is an elegy after the death of a loved one, many of the conflicting images become clearer for the performers. (The dedication of the song to Bruchmann’s mother also makes sense in this regard: she had lost her daughter Sybille in 1820, the same girl who later prompted the composition of the ghostly Schwestergruss.) Rückert says that ‘only my yearning greeting’ can reach his beloved who was snatched from his breast. These words allow the possibility of a final parting: the person to whom the song is addressed is already on the other side of the Great Divide. The phrase ‘tilget Räum’ und Zeiten’ evokes the same idea. And this image, in turn, brings Eurydice to mind, and the whole of this poem might be Orfeo’s serenade to his lost wife, a Lieder version of Gluck’s Che faro and, like that masterpiece, also in a major key which is infinitely capable of sadness and pathos. If ‘Sei mir gegrüsst! Sei mir geküsst!’ is heard as a litany, the obsessiveness of the many repeats seems more understandable, less banal. The bar of echo for ‘Sei mir geküsst!’ (Schubert was really very brave to repeat these words yet again, in view of the number of times we have heard them) comes across as someone lovingly dwelling on a wistful memory: he knows that he will never kiss her again. There are real moments of anger and passion in this music (the setting of ‘mit diesem Tränengusse’ is no piece of rhetoric but almost a sob of emotion)—and it is this energy which keeps the piece moving: the desire to reach out and touch someone in another world has an urgency about it. If the singer thinks of these declarations of love as inhabiting a spiritual dimension, this sorrowful outpouring is dedicated to a departed spirit who lives only in his memory. Such a change of emphasis makes an enormous difference to the performer: in Sei mir gegrüsst!, charming the audience should not be the first priority. It goes without saying that this interpretation goes utterly against the ‘schmalzy’ (and superficial) way with this song that has become the established Viennese convention. 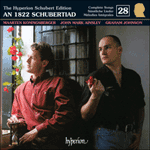 The other ghasel which Schubert wrote in this period is the Platen setting Du liebst mich nicht. There the repetitions of the title phrase suggest someone unhinged with the break-up of a relationship, and the harmonic excursions suggest someone tormented by deep and complex feelings. There is something of the same feeling in Sei mir gegrüsst!—the song is full of harmonic twists, excursions and surprises. Again these are more understandable in the context of bereavement. The form is rather sophisticated, a combination of strophic and durchkomponiert techniques, with a strong feeling of a rondo with variations. The poem’s five verses are translated, in musical terms, into an alternating ABABA, where A is the familiar melody and B is a second idea, an intense and innig melody grounded on a dominant pedal—at least for a while. Of course the two appearances of the B section follow different harmonic pathways as Schubert follows the inspiration of the moment, and the second appearance of A is essentially in the minor key. The most moving moment of the song occurs in the last verse, a much modified version of A. Here the words ‘Ein Hauch der Liebe tilget Räum’ und Zeiten’ (a mention of ‘time and space’ that prophesies the words which introduce the transformation music of Parsifal) precede a moving sequential setting of ‘Ich bin bei dir, Du bist bei mir’ which lifts the piece on to almost a cosmic plane. This is the moment of healing and resolution, and this passage acts like balm poured upon the aching wound of the singer’s grief. The wild fortissimo outburst of ‘Ich halte dich in dieses Arms Umschlusse’ which immediately follows seems to challenge the Fates themselves in a final gesture of defiance. In this singer’s mind, the grave has been overcome. This recalls the passion of Novalis for his beloved Sophie who died as a teenager—Rückert certainly knew the Novalis poems, and the almost mystical re-uniting of lovers separated by death is often to be found in the literature of the time. This is a song which has caused the Schubertian a certain amount of embarrassment—its length and intensity ill fitting the concept of a conventional serenade. If it is taken seriously on the level I suggest, however, it is capable of approaching the metaphysical grandeur of such spiritual songs as Schlegel’s Fülle der Liebe (Vol 27). Friedrich Rückert was one of the most significant men of letters of his time, and he is one of the figures (Heinrich Heine is another) who form a link between the songs of Schubert and Schumann. He was trained as a lawyer and philologist, and after a period as a teacher went into journalism. He came to Vienna to study Oriental languages with Joseph Hammer-Purgstall and soon became an accomplished translator from such languages as Persian and Arabic. This led to various distinguished university appointments, but it is as a writer that he is remembered. As a dramatist he was largely unsuccessful, but he wrote a large number of poems—some ten thousand—which were very popular at the time despite an inevitable unevenness in quality. His lyrics have always appealed to composers: apart from five Schubert songs (and two fragments), Schumann (who became a personal friend of the poet) much admired Rückert, as did Robert Franz, Loewe, and to some extent Wolf and Strauss. There is no doubt, however, that Rückert stands most often before the public today thanks to the enthusiasm of Gustav Mahler for his work. Apart from poems from Des Knaben Wunderhorn, Mahler favoured Rückert’s lyrics, as far as his own music was concerned, over those of any other German poet. Mahler’s Kindertotenlieder and Fünf Rückert Lieder (which includes the immortal Ich bin der Welt abhanden gekommen) have given the poet an unassailable place in the song repertory’s hall of fame. 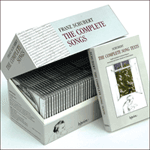 Nevertheless it was Schubert who first saw the poet’s potential in this field, and it may be said that apart from one controversial song, all of his Rückert settings from the Östlichen Rosen collection are masterpieces: Du bist die Ruh’, Lachen und Weinen, Greisengesang and Dass sie hier gewesen. There are few of Schubert’s poets, outside Goethe, Mayrhofer, and Müller, who could claim to have inspired such a sequence of great songs.